Bus from KL to Hatyai is the most economical transportation option to travel from KL to Hatyai. Apart from that, taking a bus from KL to Hatyai is more convenient because the pickup points and arrival points are in the city areas of KL and Hatyai, whereas taking a flight is less convenient as both airports in KL and Hatyai are a far distance away from the city areas. Alisan Golden Coach is a famous brand serving bus from KL to Hatyai. Alisan Golden Coach offers USB charging ports and Wifi onboard to increase their passengers ease and comfort while traveling. Similarly, Suasana Edaran also offers USB charging ports and Wifi onboard. 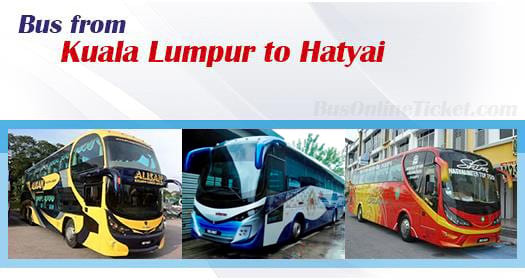 Other bus companies like KKKL, Hatyai Intertop, and Kesatuan Express also serve this route from KL to Hatyai. Their bus fares are in the range of RM 55.00 to RM 100.00, which varies with seasons. The duration required for the bus from KL to Hatyai is about 8 hours depending on traffic conditions. Due to the long hours of travel, the schedules are usually slotted for morning or night, so that passengers will arrive in Hatyai at the right time for dinner in the evening or for breakfast in the morning. The coaches are usually equipped with fully reclining seats and air conditioning, in order to ensure maximum comfort for the passengers during the journey. The coaches generally depart from TBS (Terminal Bersepadu Selatan) in Kuala Lumpur. Other departure points include Hentian Duta Bus Terminal, Chinatown Jalan Sultan, and Desa Complex (Kepong). Usually, coaches will stop for a 15-minutes break for passengers to visit a washroom or buy refreshments during the journey. In most circumstances, the buses go directly from KL to Hatyai, but sometimes they will alight passengers at Changloon before going through Malaysia and Thailand customs at the border (Note: Changloon is a small town at Malaysia and Thailand border). The bus will terminate at Hatyai Bus Station where travelers can then take taxis to go to Hatyai city centre. Basically, as long as you have an Internet access, you can book KL to Hatyai bus ticket online with instant confirmation at BusOnlineTicket.com from any corner of the world. Online booking guarantees that you save both your time and your money.